Last week we enjoyed some really nice Spring weather. On Saturday it hit the upper 70’s and it looked like Spring was finally here to stay. But as typically happens in April, showers arrived on Sunday. So much for outdoor play! 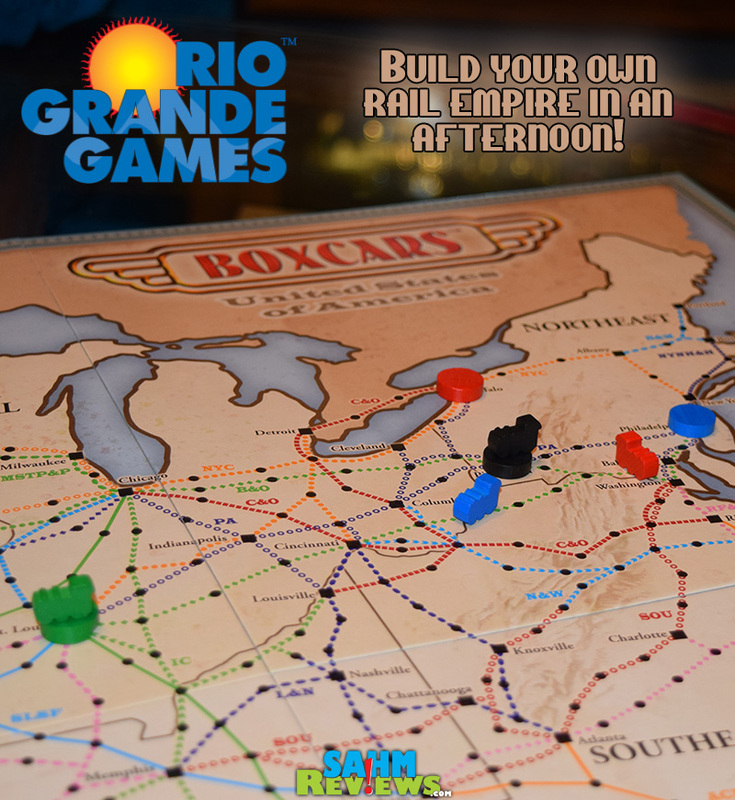 This time we were prepared thanks to our friends at Rio Grande Games who provided us with a copy of Boxcars to try out. 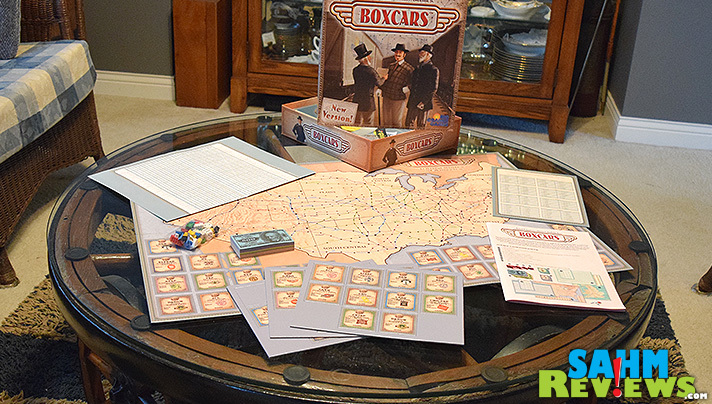 If you’ve enjoyed Monopoly you’ll love Boxcars. In fact, Monopoly was an inspiration for the inventors! In August of 1970, brothers Thomas & Stephen Erickson were playing ping-ping in their Uncle Bob’s garage and noticed a map on a shelf. They asked their Uncle about it and he explained it was for a railroad game he had envisioned back in the 1950’s that would be a cross between Pirate & Traveler and Monopoly but with new features. Tom became obsessed with this idea of a game and before Christmas had worked out all the rail lines and specifics of the game in his dorm room. He made the first board, destination spinner and payoff chart and gave it to his father for Christmas. 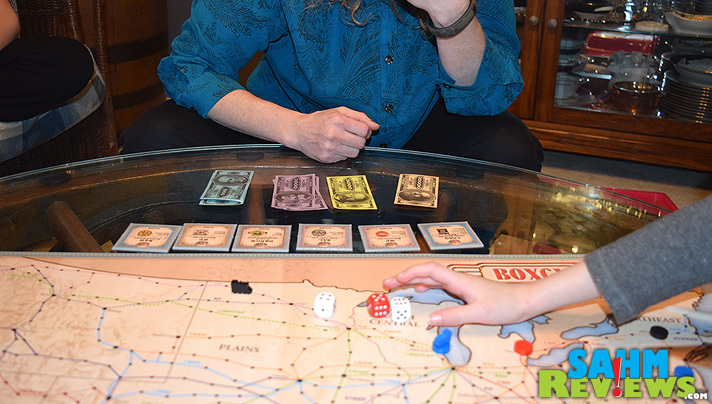 The first game of Boxcars was played that Christmas morning. After patenting the game in Bob’s name in early 1974, the first production version was created, with an initial run of 2,000 copies. In January 1975, Tom sent a copy to the Avalon Hill Company who decided to take it on after a couple more years of play-testing and negotiations. 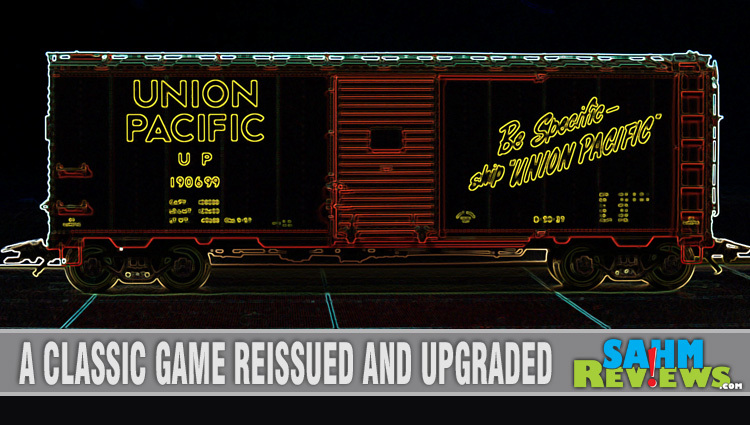 They marketed the game from 1977 to 1998 under their trademarked name, Rail Baron. 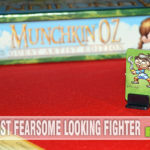 When Avalon Hill was purchased by Hasbro, production ceased. 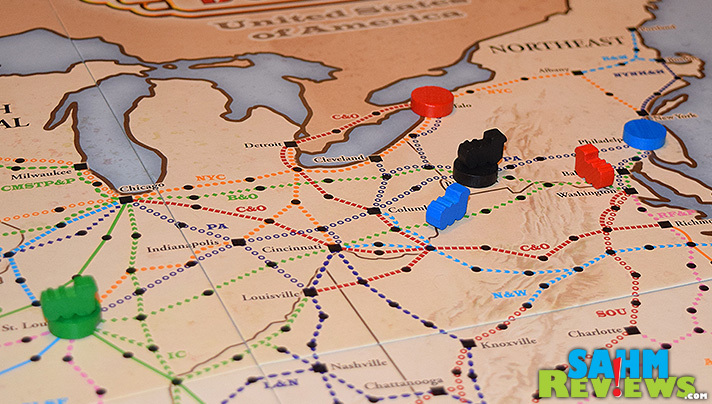 Fast-forward to 2009 when Tom was introduced to Rio Grande Games and they agreed to reissue the original Boxcars and to include a new version (a playable map of Britain) at no extra charge. 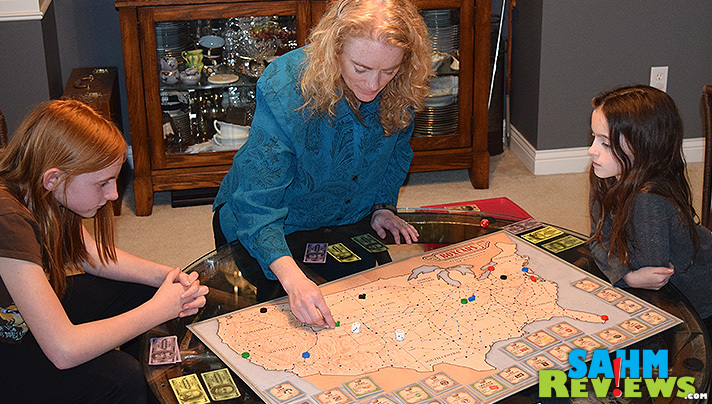 The game includes a large game board, playing pieces, play money, railroad ‘property’ cards and both a destination and payoff chart. Rated for ages 12+, I knew we were taking a chance at it being too difficult for our 9 & 11-yr-old, but after reading the instructions I knew they would be fine. The premise of the game is pretty straightforward. Your goal is to move your train from point-to-point, collecting payouts as you go that are determined by the length of your trip. The money earned is used to either purchase additional railroad lines or to upgrade your train for extra rolls. When it is your turn, you first roll to get your destination. Through a series of two rolls, the results are referenced on the “Destination Chart” and your token is placed on the corresponding city. Then you begin your trip by rolling and moving your train. Each rail line is either owned by the bank or by another player. During your turn, whichever track you use to move towards your destination city determines who you pay a fee to for its use. The bank collects $1,000 per turn, players collect $5,000 per turn ($10,000 if all railroads are owned by players). There are multiple paths to each city using different railroad tracks. As the game progresses, the route you choose has a great impact on the profitability of your trip. Strategic purchases of adjoining railroads will allow you to transverse the entire country on your own tracks for free. Receiving an unfavorable destination may cause you to travel on an opponents tracks and forcing the entire trip into the red. Once you arrive at your destination, you receive a payoff for the trip predetermined by the aptly named “Payoff Chart”. You begin the game with $20,000 and the goal is to turn that into $200,000 before heading back to your home (starting) city. When you declare and begin heading home, other players can attempt to catch your train to collect a $50,000 bonus (paid by you). Then you’ll have to continue the game until you break the $200,000 goal and head home again. Once you reach your home location and have the required amount of funds, the game is over and you are declared the winner. This is not a short game, ours taking just over 4 hours to complete. Most games are advertised to run 2-4 hours, and I can imagine this would be accurate for us now that we are all familiar with the rules. We found it to be much more fun than Monopoly due to the ability to choose your own path and not just moving in a square trying to pass “Go”. For the price (MSRP $49.99) I would have liked to have seen a little nicer train tokens to use, but I’m sure it was a cost decision that Rio Grande Games considered and decided to keep the price as low as possible while still providing a high-quality experience. If you’re looking for an engaging game for an entire afternoon, this is a great choice. Appealing to both game fanatics and train enthusiasts, don’t be scared of the 12+ rating. 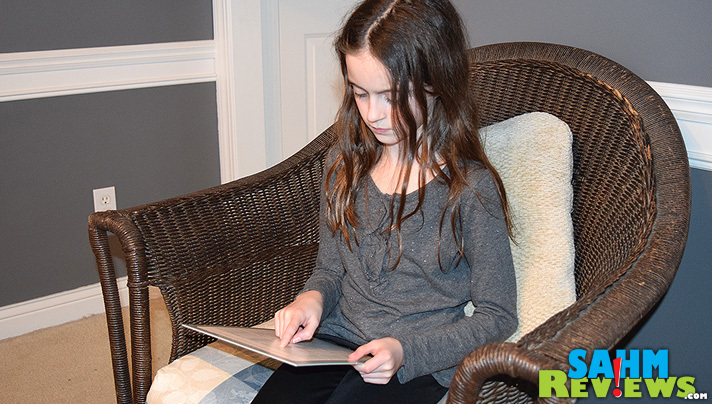 If your kids have a grasp on spreadsheet lookups (most do nowadays), then it should be fine for 10+. 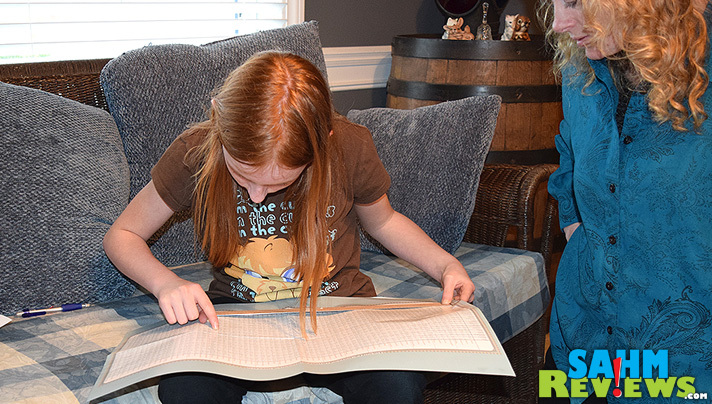 Our youngest understood the game just fine, but would have had difficulty reading the instructions on her own – which is the typical criteria used when determining the age-appropriate rating. Pick up a copy on Amazon at a discount and be sure to check out Rio Grande Games’ other great issues, including their most popular line, Dominion. With games this good, it can rain every day! I love the slower board games so this sounds like I would enjoy it. That seems like a fun game that I am sure my kids would enjoy playing. 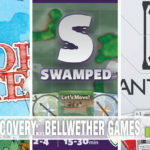 We are always looking for new games to add to our lineup! OH I seriously want this game!! My kids are finally getting into “board games’ and I’m looking for great ones to add to our collection. This one sounds like it’s the perfect fit for us! This is a game my husband would enjoy playing. I could see hours lost from our nights just from focusing on this game. this looks like such a fun game, that my whole family would love! I really like the graphics and the concept behind this game. We are implementing a weekly game night here at our house and this game would fit right in to the lineup. Ok I’m of the age that I should remember the original and don’t. Darn CRS. It sounds like a fun game. I LOVE to see games that are fun and the kids learn something as well. I need to look into this game as my son is crazy about trains and all that stuff. This looks like so much fun! My family would have a field day with this! That looks like a really fun and interesting game! Box cars are cool! Monopoly is one of my favorite games, so I am sure I would love this game too. Seems like a great game to play on game night! 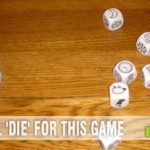 Board games are a blast! I am going to check this one out, it looks so fun! This looks like the perfect game for a rainy Sunday afternoon! So fun! Sounds like a fun game! My son would probably enjoy this because he is interested in rail history/railroads and loves games like Monopoly! Sounds like a fun, interactive and exciting game! I enjoy a good board game that last awhile keeps the fun going. This looks like a really fun game! I love the railway theme. I would love to play this game with my boys. My oldest would really love this one. I have a nephew that would absolutely love this game. He loves anything to do with trains and he loves board games. I love the railroad theme. I think my daughter would really enjoy this one. I’ll pass that along Rosey! She’s usually so fashion-handicapped she’ll be thrilled with your comment! Sound like a game my kids will enjoy! They both liked trains. And this is a perfect indoor family game when the weather is not good. Looks like a great game! Learning and fun, all at the same time, can’t beat that! 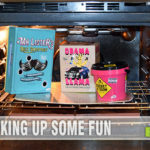 I love activities and toys that ignite some thinking with kids. Love this one. Oh what fun and exciting game. This game is on my list of purchase and I can’t wait to give it a try. Stopping by from Ultimate Blog Challenge. This looks like a super fun game and I loved all the photos that really show the game in action. 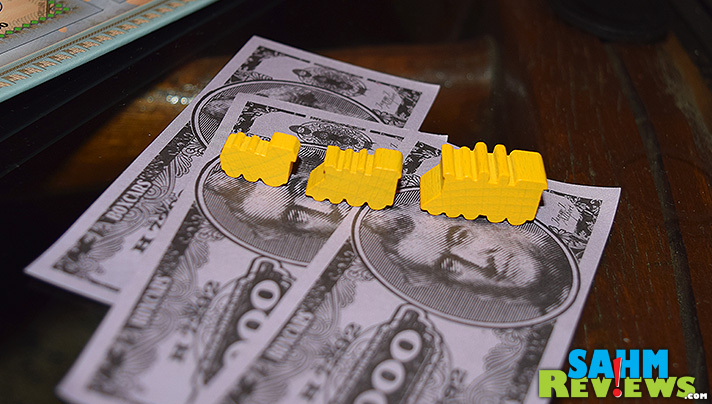 What a fun way to teach kids about money, math, geography and trains. I love it! WOW! This sounds like an excellent game for the whole family! I love the pics and all the details you’ve provided. The price is reasonable as well. Such a great learning concept as well! Thanks for sharing! Oh, this would also make a wonderful gift idea! That looks like a really fun game. All my kids love board games so we will have to check this one out. I love board games!! Building rails is a very interesting games for kids. This is one I’ve never heard of but it looks like a really fun and interesting game! I have to admit Scott I hadn’t heard of this one, but it sounds like an addictive game. I love the back story behind it. The Uncle must have been so proud to see his thoughts brought to fruition. I think it’s time to bring out a board game this weekend! I’m a big fan of long board games like this, so this is right up my alley. It’s a very interesting topic, too. Looks like a super fun game. I bet my daughter would love to play this one. that looks like a really fun game. I bet my daughter would love playing it. I have never heard of Boxcars before. It seems like it would be fun and interesting . I will have to check out all the Rio Grande Games out. Thanks for sharing.